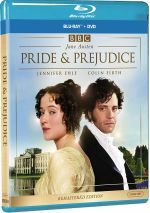 Arguably the most well-regarded filmed version of Jane Austen’s classic novel, the 1995 adaptation of Pride and Prejudice brings us a BBC mini-series. The story spans six episodes. Set in the late 18th century, Pride introduces us to the Bennet family. Headed by Mr. Bennet (Benjamin Whitrow) and his wife (Alison Steadman), the clan includes five daughters: Elizabeth (Jennifer Ehle), Jane (Susannah Harker), Mary (Lucy Briers), Lydia (Julia Sawalha) and Kitty (Polly Maberly). They go all atwitter when two well-off, eligible dudes arrive in their neck of the woods: cheerful, foppish Mr. Bingley (Crispin Bonham-Carter) and dour Mr. Darcy (Colin Firth). The marriage-minded Bennet girls do their best to entice these studs, and Jane – regarded as the prize of the pack – succeeds with Mr. Bingley, at least in the short term. Matters proceed less gracefully for the others, though a certain antagonistic spark occurs between the sullen Darcy and the snappy, intelligent Elizabeth. This doesn’t set well with Bingley’s sister (Anna Chancellor), a chilly babe who seems determined to interfere in the affairs of others. Another complication ensues when cousin Mr. Collins (David Bamber) arrives on the scene. Because the laws of the day wouldn’t allow the family estate to pass down to the women, when Mr. Bennet dies, everything will go to Mr. Collins. Thwarted in his desire to land Jane, he sets his sights on Elizabeth, the next most attractive Bennet girl. In addition, Elizabeth develops an interest in hunky Mr. Wickham (Adrian Lukis), a “lowly foot soldier” with some bad feelings toward Darcy. If you compare, you’ll see that this synopsis duplicates the one I composed for the story’s 2005 theatrical adaptation. Both tell literally the same story, so I figured I’d recycle the overview – hey, it’s good for the environment! At 129 minutes, the 2005 Pride runs about three hours shorter than this 1995 edition, so obviously, changes will occur. Both go down the same basic path, though, so the shared synopsis works. As I noted when I reviewed the 2005 Pride, I went into it with low expectations. I can’t claim to boast affection for this sort of period romance, so I assumed the 2005 flick would offer a stiff, turgid experience. To my pleasant surprise, the 2005 film fared much better than I anticipated. Bright, unpretentious and endearing, it worked very well. It took me 14 years, but I finally gave this 1995 adaptation a look. As I mentioned at the start, it enjoys a stronger reputation than the 2005 movie, so I entered it with a totally different set of expectations than I did when I checked out the earlier flick. Did the 1995 Pride live up to those hopes? Yes and no – while I didn’t enjoy it as much as the more recent effort, I found a lot to appreciate here. One area in which the 1995 Pride surpasses the 2005 version relates to depth, as it gives the characters and situations a lot more breathing room. That doesn’t come as a surprise – as noted, the series goes about three hours longer than the film, so it gets much more space to develop. And it uses this time well, as it fleshes out the components in a satisfying manner. We get a fuller picture of the circumstances and characters, along with elements absent from the film that find themselves restored in the series. That said, at times the 1995 Pride can feel like a little much. Given my initial skepticism about the source material, I come with limits to how much of this material will appeal to me, and the 129-minute 2005 version hit the “sweet spot”, as it ran far enough to satisfy but it didn’t overstay its welcome. Not that I truly think the 1995 Pride runs too long, as it uses its real estate well. For my personal preference, I just like a tighter, quicker version. There’s only so much marriage-related machinations one man can take, and five hours of this footage gets a little much. Again, don’t view that as a negative appraisal of the series itself, as it reflects more on my tolerances than anything else. While I find myself fonder of a short Pride, I think the 1995 version explores its territory in a satisfying manner that clearly appeals to a more invested audience. The 1995 take offers a strong cast, and Firth delivers a turn that makes him feel like the definitive Darcy. Cool and arrogant but not jerky, he displays the proper attitude, and we accept how he softens as the tale progresses. Ehle does fine as Elizabeth, though I admit I prefer Keira Knightley from the 2005 film, if just because she shows a bit more personality. Ehle feels like a stronger fit for the role physically, as she can play “slightly plain” better than Knightley, but I think Keira manages to add greater internal life to the part. Still, Ehle covers the role in a compelling, understated manner, and the rest of the cast follows suit, as we get natural performances all around – well, except for Steadman as Mrs. Bennet, as she creates a shrieking, hysterical character. I don’t blame Steadman, though, as the source intends for Mrs. Bennet to come across this way. It’s a jarring juxtaposition and one I think doesn’t work – Mrs. Bennet often feels like a character from a different narrative - but that’s on Austen, not the filmmakers. Ultimately, I can’t claim I love the 1995 Pride, but I do respect it as a tight, well-developed adaptation. While it might not be my cup of tea, I admire its positives and think it brings a strong version of the story. 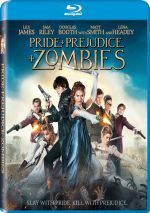 Pride and Prejudice appears in an aspect ratio of approximately 1.78:1 on these Blu-ray Discs. Shot on Super 16 film, the image showed its source but nonetheless looked reasonably good. Sharpness seemed erratic. Much of the series offered fairly positive delineation, but occasional soft spots materialized. Those likely acted as an outgrowth of the source format. The image lacked issues with jagged edges or moiré effects, and edge haloes remained absent. A few small specks appeared, but print flaws largely stayed away from the picture. Grain became an inconsistent aspect of the image. Given the Super 16 source, I expected a fair amount of grain and sometimes got it, but other scenes felt surprisingly clean. Did this stem from the use of noise reduction? I can’t say for certain, but the erratic presence of grain came with no rhyme or reason. Colors went with an earthy feel and some push toward the pink side of the street, especially in terms of skin tones. The hues never excelled but they felt fairly appealing. Blacks generally looked deep, though they occasionally veered toward “crush”, and shadows offered mostly pleasing clarity. Though the image never looked great, it held up nicely given the source’s age and format. Don’t expect much from the series’ DTS-HD MA 2.0 soundtrack, as the audio remained restrained. In terms of the soundfield, music boasted nice stereo spread, and that became the most appealing aspect of the mix. Effects had less to do. Environmental elements used the side speakers in a decent manner and offered a little movement at times, but this was a chatty series, so the effects didn’t bring a lot to the project. Audio quality worked fine. Dialogue came across as reasonably natural, though a smidgen edgy at times. As noted, effects didn’t get much of a workout, but they felt accurate enough, and music showed nice range. The audio was perfectly acceptable for this project. Seven featurettes appear, and From Page to Screen goes for 29 minutes, six seconds. It offers comments from screenwriter Andrew Davies, author PD James, producer Sue Birtwistle, director Simon Langton, production designer Gerry Scott, costume designer Dinah Collin, hair/makeup designer Caroline Noble, choreographer Jane Gibson, and actors Alison Steadman, Colin Firth, and Jennifer Ehle. As implied by the title, “Page” discusses the source novel and its adaptation as well as sets/locations, costumes, hair, cast and performances, editing and music. This becomes an uncommonly detailed view of the subject and delivers an informative view of the subject matter. Next comes A Turning Point for Period Drama. In this 32-minute, 22-second program, we hear from Davies, Collin, publicist Alan Ayres and TV critic Baz Bamigboye. “Drama” looks at some of the same topics as “Page” along with thoughts about the series’ release and reception. It provides another engaging and useful discussion. We learn about the Blu-ray’s transfer via The Technical Restoration. It fills five minutes, 36 seconds with info from colorist Vince Narduzzo. He gives us details about the work used to bring the series to Blu-ray. This becomes a decent chat but not anything revelatory. With The Definitive Pride and Prejudice, we find a 21 minute, 23 second piece with notes from Davies, Langton, University College London professor John Mullan, Second Impressions author Sandy Lerner, location manager Sam Breckman, and actors Lucy Briers, Susannah Harker, Polly Maberly, Adrian Lukis, and David Bamber. “Definitive” looks at the life and career of author Jane Austen, aspects of the story, its path to the TV screen, parts of the production and its reception. We get some good notes but “Definitive” can feel a bit fluffy and repetitive at times. Love or Money? lasts 10 minutes, one second and includes Mullan, Lerner, Davies, Langton, Lukis, Briers, Bamber, Gibson, Breckman, Maberly, and Harker. “Love” examines social situations in the story’s era. It becomes a moderately engaging piece. After this we see The Music of Pride and Prejudice, a nine-minute, 58-second reel that features Langton, Lukis, Briers, Gibson, and composer Carl Davis. As anticipated, we learn about the series’ score in this fairly informative reel. Finally, Lifestyles of the Wealthy takes up eight minutes, 39 seconds with remarks from Langton, Mullan, Lerner, Breckman, and National Trust’s Harvey Edgington. More history appears here, as we get notes about social and money-based issues in the story’s period. It’s another decent featurette. The package also includes a DVD copy of Pride. It presents the same extras as the Blu-ray. Though I prefer the 2005 theatrical version, the 1995 Pride and Prejudice nonetheless offers a high quality piece of work. It brings us a steady, well-rounded adaptation that comes with no obvious flaws. The Blu-ray delivers more than adequate picture and audio along with a fairly useful set of supplements. This winds up as an engaging mini-series.